Combination padlocks and the weather do not often go very well together. Only a small amount of rust will seize up a padlock making it inoperable. We have tested many combination locks that claim to be weatherproof and we only list the ones that have successfully passed all our rigorous salt water and freeze tests. Masterlock has done very well with this model which showed no sign of corrosion when subjected to salt water. It also has a nice dust cover to prevent dirt or sand from kicking up into the dials. A deadlocking mechanism makes it especially resilient to force attacks also. A resettable code with 4 digits means it has 10,000 possible combinations. Please note that the combination can be reset when the lock is open. If you need a lock that can only be reset using a special key then please see the ABUS weatherproof padlock. 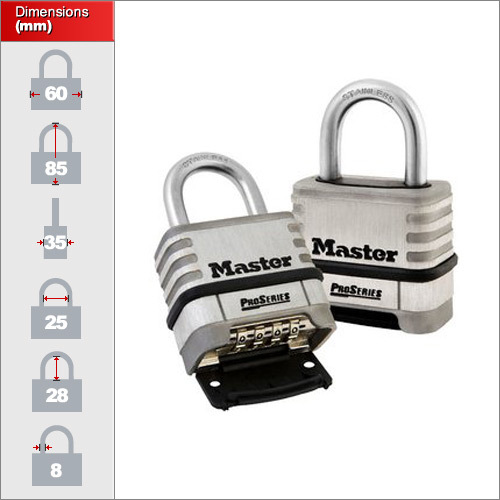 As standard we offer 1 year warrenty on padlocks but a nice little touch by Masterlock is that they have agreed to give us a lifetime warrenty! I.e. if it breaks just send it back to them directly and they will replace it. You can't argue with that! 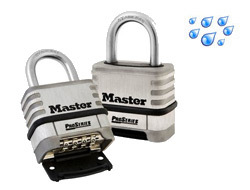 This padlock is ideal for outdoor use on gates, boats, containers, compounds and any other situation where it will be exposed to regular rainfall. For additional guidance on resetting the combination on this lock please see the following instructional video. Since the dials will rotate freely only in one direction from zero, this allows the padlock to be opened in low light conditions.